Located at 1201 Wilson Blvd., this project site is part of a mixed-use development by JBG Smith known as Central Place. The development consists of several buildings, including a residential tower, plaza, and the 31-story CEB Tower, which serves as the headquarters of CEB, Inc.
Acting as the centerpiece of the new building’s lobby, the 714 square-foot-display wraps around the facade of the elevator shaft. The display incorporates custom-designed panels that minimize the visual seam typically seen with 90-degree corners. 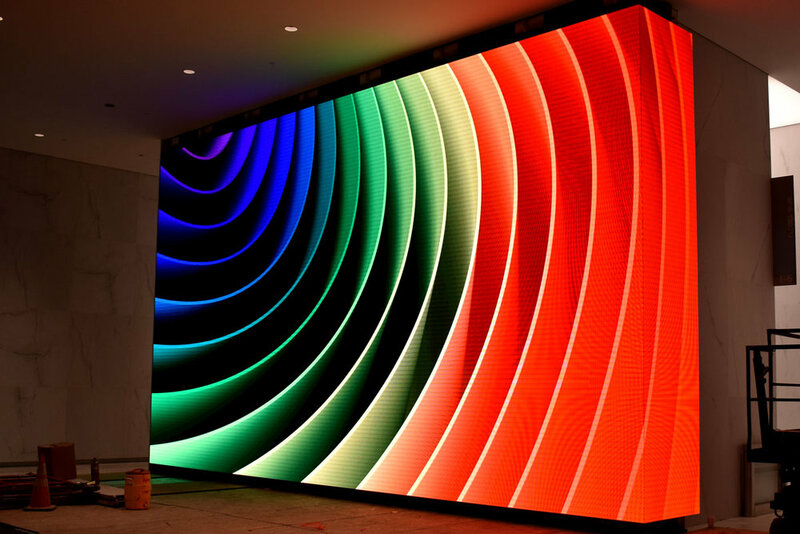 Measuring 19 feet high by 38 feet wide, this 4 mm STANDARD PITCH Interior LED S|Video™ display contains over 4 millions pixels and includes a sound system that allows content designers to incorporate various effects. Owner/developer consultant Sensory Interactive oversaw design, technology selection, bidding, and project management for the display. Following a comprehensive evaluation process, Sensory Interactive selected SNA Displays for the project based on the company's ability to adapt to the demanding project requirements and deliver displays with the remarkable resolution and build quality demanded by this upscale environment.